When we put makeup on the eye region we use colors, shapes, and lines to gain strong and deep expression. The eyelashes play a very important role, as they are responsible for creating more open and captivating look. Therefore, the eyelash mascara is a beloved item among women. 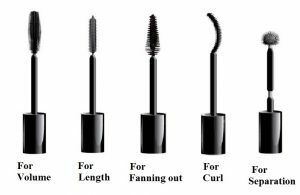 However, with the huge variety of products available on the market, it is difficult to find the perfect mascara for you. In addition, the eye region is very sensitive and deserves special attention when choosing the products that will be applied to it. Hydrate the lashes! Keeping the lashes moisturized is the first step to make them stronger and beautiful. The tip is to invest in nutritious oils (olive oil, castor oil, argan) to moisturize and make them thicker and stronger. Avoid excess product on the applicator! Before applying the mascara remove excess product from the applicator. This is important to avoid the accumulation of the mascara at the root, the formation of balls along the lashes and the stick eyelashes together. You can remove the excess in the tube itself or even use a tissue. Do not blink in the first 5 seconds after application! To avoid smudging both on the top and bottom it is nice not to flash for 5 seconds after use. The care is simple, and you can avoid a big headache that would be to clean the spots generated by the blink of the eyes and redo the makeup of the spotted place. Ware waterproof mascaras only on special occasions! The waterproof eyelash mascara, as everyone knows, is more difficult to remove and often, when trying to remove it, the eyelashes break down and eventually fall off. For this reason, it is advisable to use this type of mascara only on more special occasions. If your regular mascara does not keep your eyelashes curved and volumized or you feel the need to use a stronger fixation every day the tip is to apply a standard mascara layer before the waterproof layer. You will notice how easily you will clean your eyelashes and they will remain curved, free of smudges and with less chance of breakage. Use the eyelash curler before the mascara! It is essential always to use the eyelash curler before applying the mascara, as curving the eyelashes after applying the mascara, as well as dirtying your eyelash, increases the possibility of breakage and your eyelashes can glue to each other. Keep the curler clean and dry! Another important tip about the eyelash curler is to always leave it clean and dry before using it. The risk of ruining your make is higher if the eyelash curler is wet, and clean so that the pad does not transfer any residue or bacteria to your eyes. Again, the eye region requires extra care, because it is quite sensitive. That is why keeping your curler clean will avoid any risk of irritation or infection. Do not use old products! A mascara lasts for about six months. Because your skin around the eyes is very sensitive, always pay attention to the expiration date. Not only will you not get the desired effect, but an old mascara can actually damage your eyes. The mascara is the last step of the eye make-up! It seems obvious, but it is always good to remember that the lashes should be curved and receive the mascara after all the eye makeup is finished. With curled lashes, the application of others eye products (shade, pencil, and eyeliner) will become more difficult. Remember to remove the mascara! At the end of the day, it is very important to completely remove the eyelash mascara, as well as all the makeup. Besides the possibility of irritation, not removing the make-up will weaken the eyelashes, increasing the chance of breakage. To remove, invest in makeup removers that do not hurt the eyes. It is also possible to use baby shampoo or wet wipes, and always remember to be careful and make delicate movements. Zig-zag. The first step is performed with the mascara wand horizontally in a back-and-forth sequence (left and right). The purpose is to increase the volume of the lashes by depositing the mascara at the base of the eyelashes. The curve from the outside. This movement is the most basic, known and made by women. It consists of applying the mascara following the natural curve of the lashes, starting from the root towards the tips. The effect generated is more curved and longer lashes. Curve inside. This movement consists applying the mascara following the natural curve of the lashes, but in the upper part of the lashes (close to the eyelid). With this step, you gain an extra curl and longer lashes. In the corners. It is important to give a special retouch to the outer corners of the eyelashes. In this area the mascara has the function of lengthening the line of the eye. 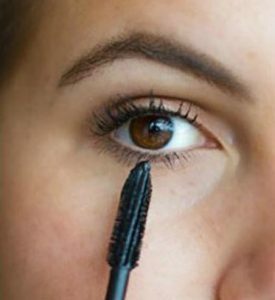 To avoid smudging, apply the mascara using the end of the mascara wand. Blinking. A trick to further bend the lashes is to apply the mask while you blink voluntarily. It is important that the blink is slow and careful, to avoid smudging. Vertical. Positioning the wand vertically is the necessary movement to apply the mascara on the lower lashes. This will allow you to reach the most difficult corners and also avoid smudging the skin. Choose the Right Wand! There are different types of applicators available on the market, and each of them makes a different effect and also reach different areas of ​​your eyelashes. Begin the application from the root! It is very important to remember to apply the mascara first on the root of the eyelashes, as they create a base for them and keep them longer and volumized for a lot of time. Get rid of stain! It is quite common to stain the skin by applying eyelash mascara, and so there is no reason to panic. 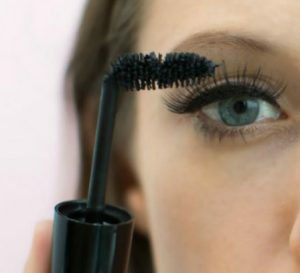 The best way to clean the dirt left by the mascara is to use a cotton swab. Its shape allows you to clean only the spots without ruining the rest of the makeup. Renewing the old mascara! Because it is a liquid cosmetic, the eyelash mascara can dry over time and with that the effect of it is reduced or lost. To try to regain the liquid from your mascara, simply add a few drops of eye drops to the product and mix with the help of the wand. Remembering that this is a tip to use in emergencies and not to prolong the life of your mascara. Don’t forget the lower eyelashes! The trick for more striking and dramatic look is to apply the mascara also on these smaller eyelashes. Old wand in the new mascara. If your new mascara doesn’t have the same wand as your old one and this is the best shape for you, a tip is to use the brush of your old mascara to apply the new one. Santa Powder Layer. To add more volume to the lashes, apply a layer of compact powder over the lashes between the first and second layer. You need to use this trick carefully. Do not exaggerate the amount of the powder so that no residue of the product falls into your eyes. Fold the applicator! A trick that can make the mascara easier to apply is to fold the applicator end (just the part of the brush). Be careful not to break the wand. 2 in 1 Mascara. It is a great idea to use the mascara as an eyeliner. Just use some eyeliner brush and your eyeliner application skills. Fill your eyebrow! Another idea to use the mascara for a purpose other than its original is to use it to fill the eyebrows. It is necessary to dose very well the amount of the product. This will avoid the powerful effect and will make light and long movements to create a harmonious filling. Invest in the layers! To enhance the effect of your eyelash mascara it is interesting to invest in more than one layer. However, 3 or 4 layers are enough. It is important to wait for the previous layers to dry before applying a new one. Combo Lengthening + volume. If you want to have volumized and longer eyelashes at the same time you can use two different brushes during application. The first one fuller to give volume and then one thinner to stretch and separate the lashes. Separate your eyelashes! Depending on the applicator and the mascara, the eyelashes can stick to each other. This way you can loose the natural look. So to avoid the “sticky effect,” store the applicator from old mascara and use it to comb and separate the lashes without adding more product to them. The spoon trick. 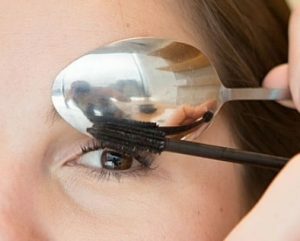 A spoon can be used to bend the lashes. To do this, just place it over the eyes and perform the movement of pressing and releasing the eyelashes against it. In this way the eyelashes will gain curved effect due to the shape of the spoon. Also, holding the spoon over the eyelid at the time of applying the mask can help prevent smudging. Warm the mascara and the eyelash curler! Finally, two simple tricks that can contribute to the improvement of the final result. Warm the curler with the dryer for 5 seconds and immerse the package of mascara (tightly closed) in a glass of slightly hot water for 5 minutes. When warming up the curler, the eyelashes gain more easily the desired shape. You only need to test on the skin before applying on the eyelashes, to avoid burns or the breaking of the lashes. The heated mascara becomes more liquid, facilitating the application. Now just join these tips with the tricks you already use when you apply your makeup to win fuller lashes and look even more beautiful!